Terry Young of Woodbury pilots the hydrogen powered car. LONG BEACH, Calif. - Middle Tennessee State University alternative fuels researcher Dr. Cliff Ricketts achieved a career goal and etched his name in history by driving 2,600 miles across country and using no gasoline. 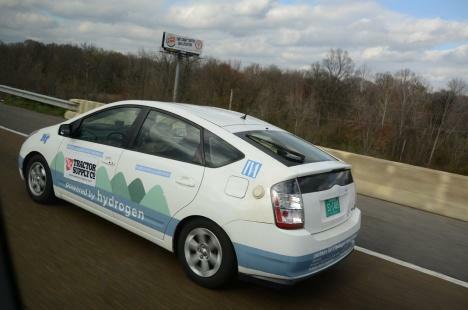 Ricketts and co-driver Terry Young of Woodbury, drove coast-to-coast on hydrogen from water separated by sun (solar), all produced on the MTSU campus. "I believe this is one of the most historic things that's ever happened," said Ricketts, a native of Mt. Juliet, Tenn., and 37-year faculty member. "We're so dependent upon foreign oil, and what I have shown is that with sun and water we can run vehicles on sun and water all across the country." "After 25 years, I finally reached my goal of going coast-to coast on nothing but sun up above us and water, from the beach right here" he added. "I've got a great support team, Terry Young and probably 50 to 60 students over the last 25 years working on many components of it." Toyota of Huntington Beach recognized the team’s effort on Friday. Ricketts, 64, and Young drove a 1994 Toyota Tercel and a 2005 Toyota Prius in their quest. The quest began March 9 as the group began at the shores of the Atlantic Ocean at Tybee Island, Ga. The drive has passed through Tennessee, Arkansas, Oklahoma, Texas and New Mexico along the way. Ricketts' trip comes at a time when gas prices rose significantly in February, passing $5 a gallon for regular in several states. As of March 14, AAA said the national average was $3.70 for a gallon of regular gas. Not because his name is attached to the project but Ricketts said this research has greater world, economic and environmental implications than putting a man on the moon. Brentwood, Tenn.-based Tractor Supply Company, the MTSU Office of Research and Louisville, Ky.-based Farm Credit Services of Mid-America are the primary sources of Ricketts' 2012-13 funding. TSC contributed $25,000; the research office provided $12,500.